To utilize a multifaceted approach to investigate slips, trips, and falls (STF) by developing tools to identify, report, and remediate STF hazards in the workplace, providing recommendations for footwear based on empirical evidence, and identifying features of mobile equipment ingress/egress systems that pose a risk of STF. Slips, trips, and falls (STFs) are the second-largest contributor to non-fatal injuries in the U.S. mining industry. Although well-established as a major source of injury, workplace STF hazards are still widespread. Few context-specific resources are available that mine operators can use to identify and remediate STF hazards in the workplace. There is also limited knowledge on the influence of mining footwear on gait. In addition, the ingress/egress systems of mobile equipment are a major contributor to STF injuries; however, the elements of the system that pose a risk are still unknown. Although many mine operators acknowledge STFs as a problem, they often do not have the resources or expertise to address the problem in a systematic way. In addition, the problems highlighted, such as footwear and ingress/egress, may apply to industries other than mining. 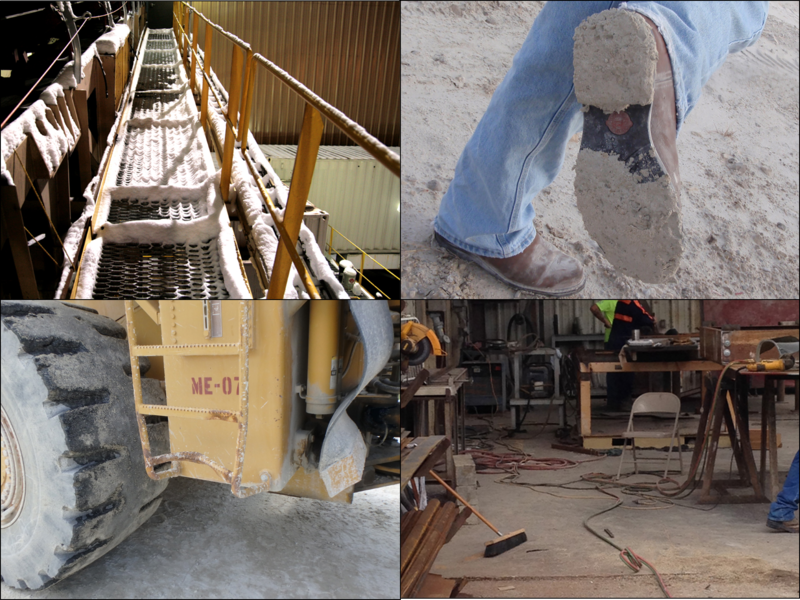 Slip and fall hazards identified at mines: contaminants on walkways (top left), material caked into boots (top right), bent rung of mobile equipment ladder (bottom left), and trip hazards around shops (bottom right). Develop tools to identify, report, and remediate, in a timely manner, STF hazards in the workplace. The goal is to provide miners and mine operators with multiple tools to identify STF hazards, help report and track these hazards, and provide recommendations to remediate the hazards. Preliminary work to identify STF hazards in the mining environment will (1) categorize STF hazards from standards, guidelines, and observations into a STF hazard taxonomy, and (2) evaluate the time spent exposed to and the frequency of encountering the STF hazards. This work will inform the development of a toolkit, with multiple tools to identify, report, and remediate STF hazards in a timely manner. 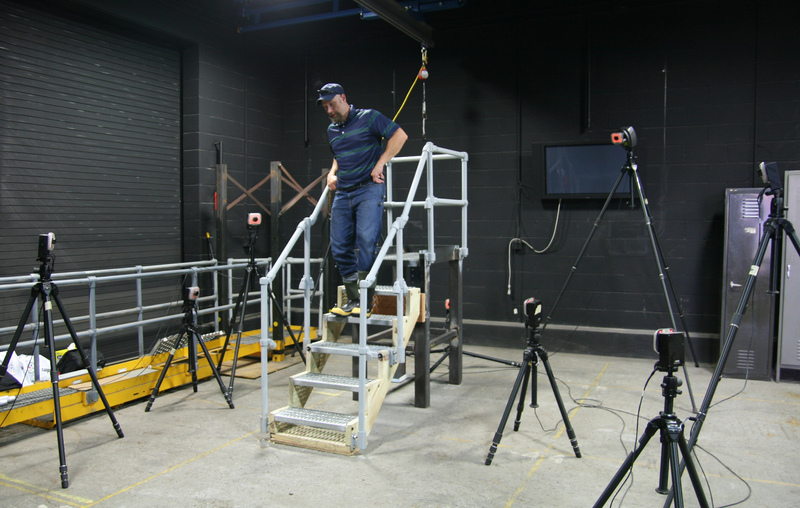 Investigating the influence of metatarsal boots on stair ascent and descent. Provide empirical evidence of any gait modifications associated with wearing metatarsal boots that may increase the risk for STF. The goal is to provide information to mine operators to help them determine when the risk of a trip or fall due to wearing metatarsal boots outweighs the benefits of the added foot protection. A laboratory study will identify if there are changes in gait, toe clearance, and heel clearance when wearing metatarsal boots as compared to regular safety toe shoes during ascent and descent from stairs and inclined walkways. The sole of a new work boot with its accompanying 3D scan (left) and the same boot after a year of wear (right). Provide empirical evidence and recommendations for boot replacement based on tread features to prevent STF. The goal is to inform mine policy and practices by providing miners and mine managers with the knowledge to determine when to replace footwear based on wear patterns and decreased tread depths. As part of a longitudinal field study, miners will be given a new pair of boots, and tread depth of the outsole will be tracked over the life of the boot along with other metrics that relate to STF. Laboratory testing will help identify if the boots provide adequate slip protection at the end of the field study. Hazards in parking areas which lead to ingress and egress injuries from mobile equipment including uneven surfaces, ruts, rocks, and hoses. Identify which features of the ingress/egress systems pose a risk of STF to mobile equipment operators and if mine operators are aware of alternative ingress/egress systems for purchase. The goal is to identify components of ingress/egress system that can be made safer, allowing mine operators to make better purchasing decisions and encouraging the design and acquisition of systems with better STF protection. Analysis of MSHA injury data and interviews and focus groups with equipment operators will help identify components of the ingress/egress system that can lead to STF. In addition, a laboratory study will evaluate mobile equipment ladders with varying rail flexibility, which are commonly used in the mining industry. 5. Identify characteristics for appropriate footwear for use at surface mining facilities. The goal is to develop a list of desirable and undesirable characteristics for footwear used in the mining industry based on all the aforementioned work, field visits, a review of literature, and discussions with miners and mine operators. Although this project focuses on surface stone, sand, and gravel mining operations, some of the findings may be generalizable to other commodities and operations in mining and other industries.